As you know I am an outspoken advocate of thinning woodland stands, suggesting that for many (not all) family landowners “thin early, thin often” is the path to the future forest they envision. Amy and I have posted numerous articles illustrating the many reasons for and benefits that thinning provides to family forest landowners. This single practice applied with purpose, at the appropriate times, can shape a young forest into a uniform timber stand…. or a complex and chaotic habitat for wildlife. The choice is really up to you. OSU Extension released a new publication this summer to help landowners better understand, visualize and apply thinning decisions to their properties. 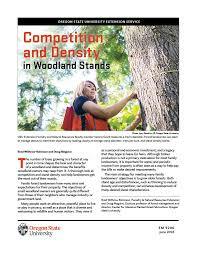 Competition and Density in Woodland Stands EM 9206 describes in some detail the effects that different levels of competition has on a developing stand of trees, introduces Relative Density as a way to determine the level of competition, and presents a unique new style of stand density table as a way to apply this information in the field. The publication provides examples of how the tables can be used in determining if, when and how many trees to remove in a thinning, according to the objectives of the landowner. It includes printable stand density tables for six different Oregon tree species. Make this publication part of this winter’s reading list. © 2019 TreeTopics, all rights reserved.